There is so much qualifying I have to do before actually reviewing Critters: A New Binge. I hope you’ll stick with me through it all because it’s a lot. Okay, let’s get an easy one out of the way: I love Critters. It’s one of my all-time favorite movies and I’ve seen all the films more times than anyone ever should. I’ve written about the first film’s impact on me, and we even did an episode on the entire series. Needless to say, there is plenty of proof that I’m a sucker for these hairy little monsters. Next, it’s important to note that Critters: A New Binge was produced for Verizon’s defunct Go90 streaming service. Even though this is a Shudder exclusive, they had nothing to do with the actual production of the show. The series had been shot but was left without a home when Go90 died. Instead of leaving it on the shelf, Shudder decided to pick it up and release it. I’ll come back to this later. Still, you need to keep in mind the kind of budgetary limitations and intended audience that Critters: A New Binge was dealing with..
Last but not least, it’s crucial that you know who was behind this newest foray into the Critters series. Director/co-writer Jordan Rubin and his writing partners Al & Jon Kaplan are probably best known for the 2014 comedy/horror Zombeavers, a movie about zombie beavers. They also have a film out this year about a consumer drone that becomes possessed by the spirit of a serial killer. It’s called The Drone. It should be pretty clear where these guys land when it comes to their take on genre material. I’m not discounting that approach as a whole. You just need to know that that’s the kind of influence they decided to bring to Critters: A New Binge. There are things in Critters: A New Binge which are either admirable or outright enjoyable. The story wants to highlight the Crites as much as possible, and that means extensively showcasing Crite civilization and turning the Crites into fully fledged characters. Critters: A New Binge has more Crite dialogue than all four previous films combined. That’s not a bad place to start your story from, but like nearly everything in Critters: A New Binge, its purpose is only ever for lowbrow and parodic comedy. Thankfully, that sometimes works when it comes to killing off Crites. We get a smattering of fun gags with the Crite deaths that are goopy in simple but pleasurable ways. Also, it’s really fun to see people like Gilbert Gottfried and Thomas Lennon pop in for a few scenes. Between his appearances in Critters: A New Binge and Puppet Master: The Littlest Reich (my review), I have a feeling we’d get along when it comes to our love of “tiny monster run amok” films. And that’s about as much enthusiasm as I can muster for Critters: A New Binge. Again, I should state that the filmmakers’ approach to comedy is not one I think works for this franchise. This is juvenile humor of the Friedberg/Seltzer variety and it never lands. This is a show that makes lazy reference gags to Avengers: Infinity War and The Matrix. Not to mention sexual humor which reaches a point that’s ludicrous in all the wrong ways. I’m not going to spoil it as it ends up being the crux of the story, but it’s an idea that is childishly absurd and sophomoric in very bad ways. And I’m not above that kind of material — I just listed Jackass Number Two as one of my favorite movies on Twitter the other day — but it feels so forced and out of place here. Rubin and the Kaplans don’t feel like they know or love this franchise — there is a minor character in Critters: A New Binge named Charlie and there isn’t even an attempt to tie that back to the series’ most recurring character — and instead wanted to use the base components of Critters to make their own goofball flick. What’s truly disappointing about Critters: A New Binge is that there is an opportunity here for something decent. The Crite puppets aren’t bad even if they aren’t nearly as well-crafted as the original Chiodo brothers versions. But, the way they are lit 99% of the time makes them come off as plasticy and dull. There is one shot of a Critter smoking a cigarette that’s lit in a way that makes the puppet feel like a character. If the production was able to shoot the Crites like that more often, that would at least be a shining light in the darkness of Critters: A New Binge. Instead, this is a series (well, basically a movie cut up into eight segments that run about ten minutes each) that feels like a cheap joke at the expense of the franchise. And that’s where I come back to Shudder and the original intention for Critters: A New Binge. It seems that this was made with the intention of A) getting a niche audience to come check out Go90 as a streaming service, and B) to nab unsuspecting viewers with something so over-the-top that it generated some word-of-mouth. If this had been under the auspices of Shudder from the beginning, I think it would have turned out very, very different. Shudder is currently producing a series based on another one of my all-time favorite films, Creepshow. If you look at the people they have involved with that series and the source material they are using for their stories, it becomes obvious that they understand and respect the sandbox they are playing in. They are a company that loves these genre properties and wants to do right by them. I have to believe that their pickup of Critters: A New Binge came more from a place of loving preservation for this property than one of genuine enthusiasm about the finished product. And, when all is said and done, I hope Critters: A New Binge means that the franchise now has a home at Shudder. 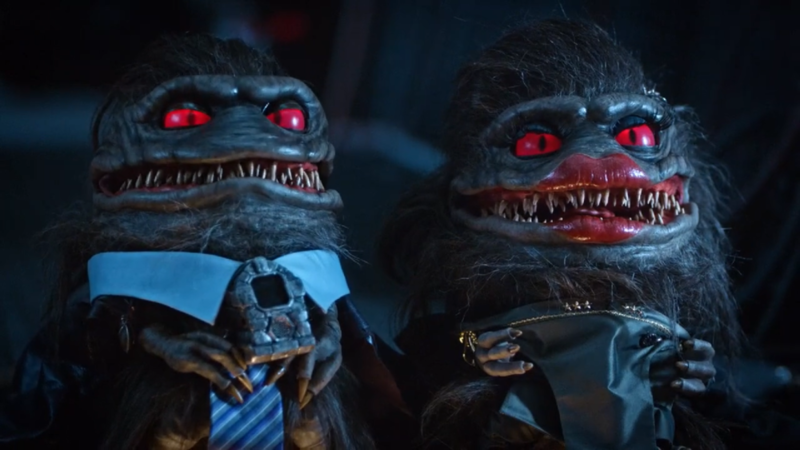 I want more Critters movies (it’s rumored that might be happening) and I’d love for Shudder to have a hand in the actual development and production of a new Critters project. Heck, I’d pitch them my take if they’d listen! I feel that Critters: A New Binge will end up as a bizarre footnote in the series and that’s probably the best it can hope for.